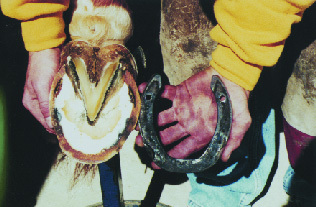 ﻿﻿﻿The industry has debated hot/cold shoeing for years. It will probably continue for many more. We asked for some opinions on the issue. It seems that even those that are hot fitting don't believe it is absolutely a must- and don't hot fit everything. They feel the foot prep and the final shoe fit are the most important thing- not how you get to the shoe fit. One thing seemed to be common in the discussion. A good reason for shoeing hot is the fact that it is much easier to shape a hot shoe. But there were some other issues. In fitting, the burn mark left on the shoe is a clear indicator as to where you are with the fit. You can know at a glance what adjustments you need to make. If you are doing much boxing or beveling of the heel area this burn mark also leaves you a clear mark to know how far to go with the bevel. When using clips, the hot fit will allow you to better seat the clips without having to cut or rasp the wall as much. It may still be useful to notch out the base area so that you save some time in the seating of the clips. A hot fit will generally result in better wall contact. 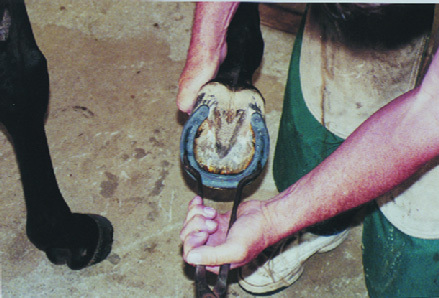 If the hoof or the shoe have any spots that are not 100% level the hot fit will ensure that there is still solid contact. There was also some feeling that hot fitting can help seal the white line area and is especially helpful for the wet foot. However, we don't know of any studies that have proven these points. There are a couple things to remember when you are hot fitting. a. First of all leave some foot when you trim to allow for the hot fit, perhaps 1/8" extra. 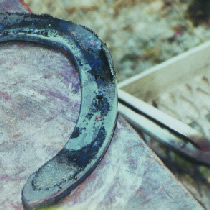 If you have taken the foot down too close and you then burn the shoe on you will very likely end up with a sore horse! b. Don't take a shoe with a real bright color to the hoof. There are stories all around about flames shooting off the wall and even catching tails, beards and other things on fire with shoes that are too hot. A dull red is plenty of heat. c. Always relieve the sole after the hot fit. 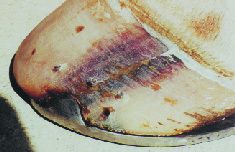 You will see a small "burn" ridge on the sole area that can create a problem if you don't pare it. d. Remember that any blows to reshape a shoe after the hot fit may cause you to lose the shoe to wall contact that you created. A final heat and trip to the foot just to ensure this good contact will be helpful. In summary, the farriers we spoke with that hot fit have simply found it to be easier and give them better results with less effort. But not one of them said they believe you can't do a good job shoeing without hot fitting. Of course we also heard from many that the modifications that they use on a regular basis are not easily done cold- so having the forge is an absolute must- even if you don't hot fit. ﻿1. 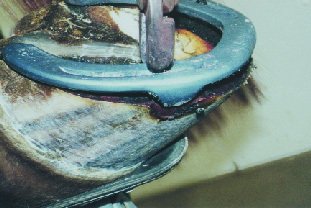 Shoeing hot can have some advantages - notice the even burn across this shoe. 2. It’s helpful to have a hot fitting tong, like this Bloom tong, to get even pressure. 4. 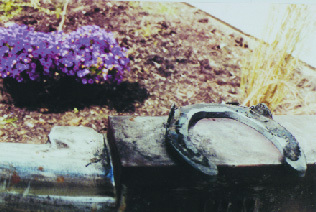 A closer look at the burn marks on the shoe. 5. The clip is now fit into the wall, flush so it can’t be caught or stepped on. 6. On this reset, you can see how the careful burn creates a good set for the clip.